In a city like New York, figuring out where to stay can be as daunting a task as deciding where to eat. And much like the abundance of restaurants and food vendors, New York City most certainly offers hotels to suit every budget, taste and style. When Rebecca and I started planning our trip to the Big Apple, we knew what was important to us: location and a big, comfy bed. A good price wouldn’t hurt either. We started our hunt for a boutique hotel online and, after exploring a number of travel sites, came across Distrikt Hotel – the newest shining star in the Ascend Collection from the Choice Hotels International hotel family. The pictures promised something marvelous, but it was the proximity to the subway and a few major attractions that sold us. 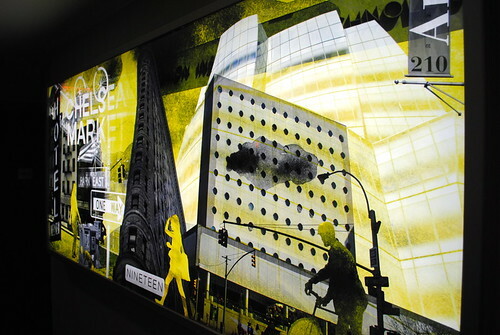 Having just opened in February, 2010, I can attest to the fact that Distrikt Hotel offers an accommodation experience that is entirely its own. When first entering the lobby, I was instantly impressed with the minimalist but tasteful décor. Organic elements such as carved wood and a living wall of vines caught my eye and attractively complimented the marble, stone and brushed steel detail. Also noticeable to me was the music. Rather than the standard lull that can be expected in elevators, Rebecca and I were greeted by themed tunes such as “Empire State of Mind” and “Angel of Harlem”. 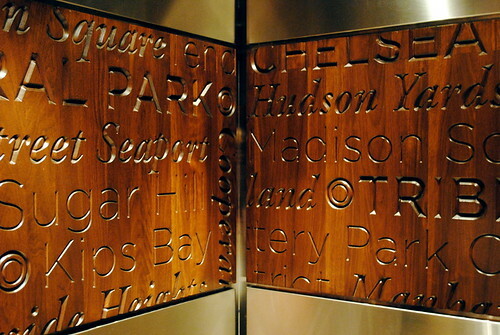 Containing only four guest rooms each, the floors at Distrikt Hotel pay homage to the distinct and flavourful neighbourhoods that make New York City what it is. Boasting northeast views to the Times Square district and a gigantic king-sized bed, Rebecca and I found our room on one of the Chelsea Market floors (nestled below midtown Manhattan, Chelsea Market charms with a community feel much like Vancouver’s West End). I’m one of those people who believe that it’s the little things in life that count, and this much is also true of Distrikt Hotel. 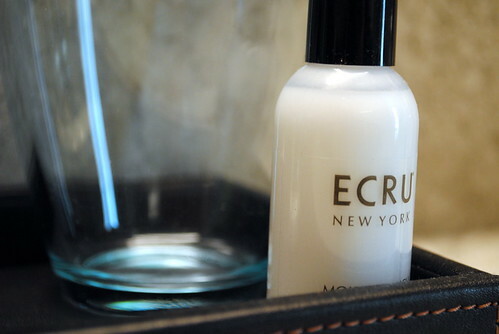 No detail was overlooked, from the luxe Frette linens imported from Europe to the Ecru New York bath and beauty products. One can argue that our room was spacious by NYC hotel standards, but I’d venture to say it was spacious even compared to my own apartment. There was plenty of room for stashing our multiple pairs of shoes, as well as our many, many shopping purchases. At the end of each long day, Rebecca and I enjoyed nothing more than sinking into our plush bed, cranking the air conditioning and allowing our plasma TV to carry us into a deep sleep. And downstairs, the Collage Bar & Bistro made sure we never went hungry. 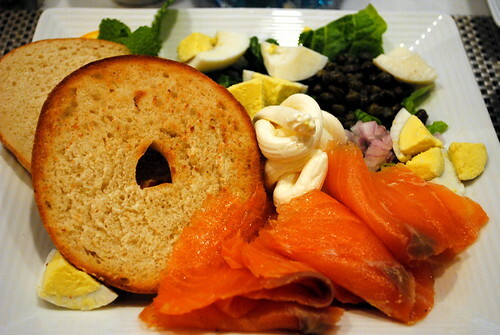 While nosh is easy to come by in a city like New York, having a scrumptious food option within the hotel was a lifesaver for us on more than one occasion. While I knew that visiting New York City would be the trip of a lifetime for us girls, anyone who has travelled knows that the right hotel can make or break a vacation. 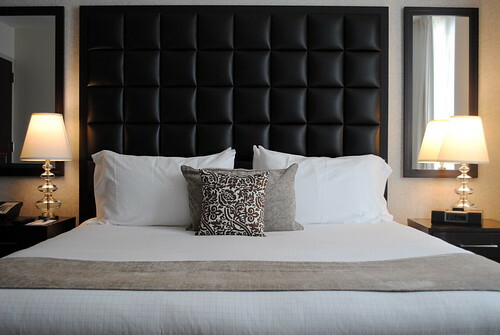 The courteous and well-informed staff at Distrikt Hotel made sure that our stay was nothing short of perfection, and I am most certain that I’ve found my home away from home on future trips to the Big Apple. 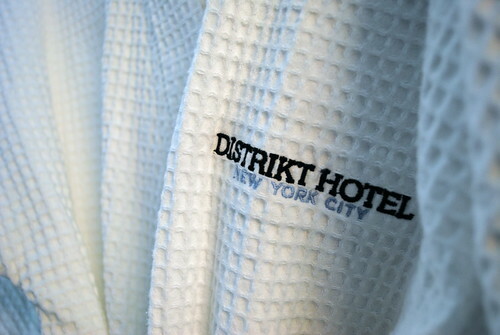 For more information on Distrikt Hotel and to book your next visit to New York City, please visit Distrikt Hotel’s website or call the hotel reservation line at 1-888-444-5610. 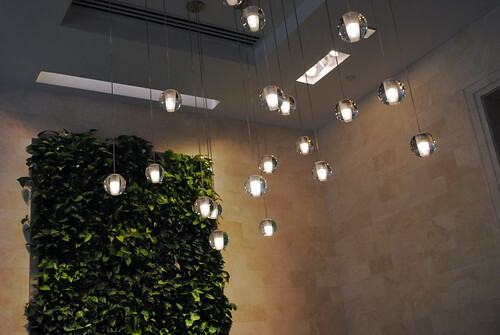 Distrikt Hotel is located in the heart of midtown Manhattan at 342 West 40th Street, New York, NY. Disclaimer: Rebecca and I were not asked to write a review of Distrikt Hotel, nor were we compensated for doing so. We did, however, received a complimentary room upgrade and several complimentary dining experiences. Beautiful hotel…I have already told a few people about it. Hopefully a NYC trip is in my future and that bed does look heavenly! I was going to ask where you were staying and what kind of deal you got while you were there… but that would be creepy. Thanks for the report. I still want to go to NYC. @Theory – Definitely go! 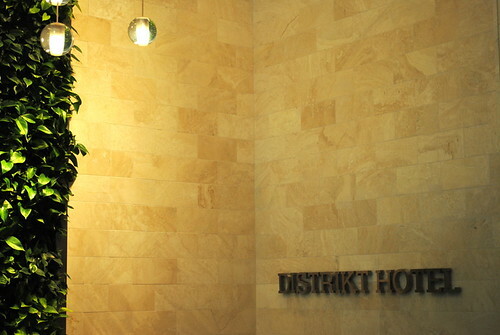 Check out Distrikt because their rates are great and they’re so close to everything you’ll want to see and do. That looks like a fab place to stay. My cousin is going to NY in 3 weeks and I’m going to recommend that he looks up this hotel for his stay. I came across this hotel last night on Expedia, and then coincidentally saw your photos and Rebecca’s photos on Flickr. Your reviews have been a great help!